The Windows 8 has come with new Start screen and separate desktop. Just switch the screen to get anyone of the screen either Start screen or desktop. 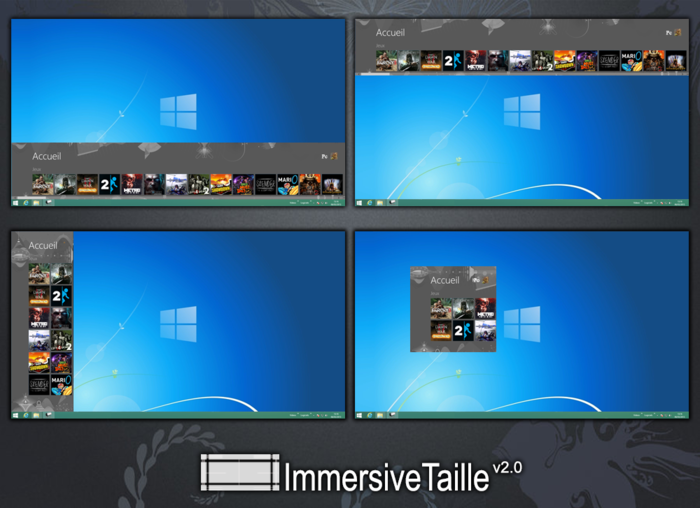 ImmersiveTaille is new Windows 8 Utility that will show the home start screen and Desktop in the same window. This application is responsible for showing the two screens in the traditional desktop Window. After that you don’t need to flip the two screens. Using the options you can choose to set automatic shutdown while restoring the original appearance of the home screen. Useful if you enable the option to see the home screen when the program starts (combined with oblytile) you can have your personal space as an example for your games, software … Advanced mode allows you to set the home screen where you want on your desktop and the size you want. This software is more useful if you are not satisfied with new home start screen of the Windows 8.